"Is this real? 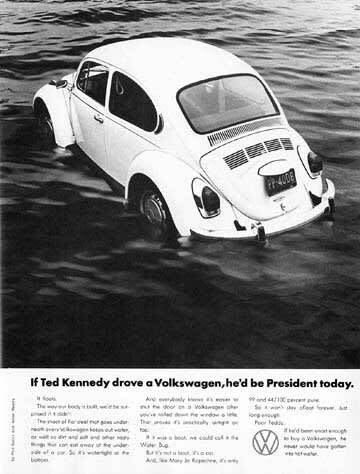 Ted Kennedy would have been president had he not killed Mary Jo Kopechne in a drunk driving incident at Chappaquiddick. This ad cleverly points out had he been driving a bug they would have just been all washed up. I have now just ruined any chance I had at becoming a Kennedy so thanks for that. I hope you are happy."